We were assigned to create a unique Agenda cover for next year's DRHS students. 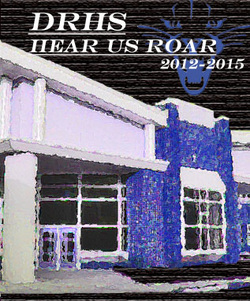 We had to include the Wildcat Logo, the name DRHS, and use only blue, black and white. This is my piece for this assignment. I stumbled upon Pugliese while I was on Pinterest under the Art category. The picture was of a painted beetle with something in its shell. I clicked on the photo and went to the link and voila! I had found an artist to study! Pugliese is a modern artist and he uses metal and paint to create awesome sculptures. He has three distinct styles so far: The Guardians (right top), Extra Moenia (right middle), and Beetles (right bottom). I liked Pugliese because he really displayed how versatile art can be; there are some many styles, medians, and ways to make art, and he really exercises that. When I first saw Bouguereau's work I was pretty mind-blown. How the heck does someone have that much talent to create something that looks like that! Dear Lord, bless me with these mad skills. Amen. I think I really chose Bouguereau because he could make such a mundane scene look like something of great importance. And he made paint look like it could have a conversation with me, could start breathing and moving. He can capture deep emotions and feeling with a paintbrush. An excellent example of this is The Hard Lesson (pictured above). 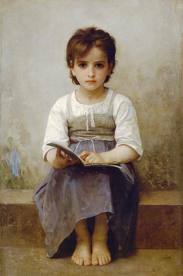 Bouguereau lived during the realist movement, living in the mid- 19th and early 20th century. Bouguereau really showed me how important emotions can be in a piece, and even though we have different styles, his message still came across.